“Oh World (Open), thou wast a Forrest to this hart (Elizabethan for “stag” or “deer”), and this indeed oh World (Open”), the heart of thee” (For “thee,” read: “The American Swiss Circuit”); with apologies to Shakespeare’s Julius Caesar. For many years Americas’ premiere Swiss was anchored in Philadelphia, but in 2007 a contract glitch with the Sheraton City Center Hotel, which had picked up the tournament after the demise of the Adam’s Mark in 2005, forced the World Open to wander out into the Forrest. It landed in King Of Prussia, Pennsylvania (named, not after a king, but after a 17th century pub near Valley Forge, not too far from Philly). There were two hotels attached to the Convention Center, a Radisson and a smaller hotel called the Scanticon (which was much closer to the playing site, although this was not discovered, even by the organizers, until we were actually on the premises). The playing conditions at the site itself were ideal: good lighting and lots of room for the players. However, the hotels were less than great. Suffice it to say the ambience was fine but the service was not. The total absence of available food after evening rounds (except for candy and snacks from vending machines) was the players’ biggest complaint. The early cutoff date and the sale of rooms for far more than the chess rate—when the hotel still had plenty of rooms available—did not help attitudes either. Perhaps these problems can be fixed by the time the World Open revisits this site in 2010, or so we hope. For the next two years we will happily be back in the Sheraton in the heart of Philly. Enough talk of the site. The winner of the 35th Annual World Open was young Los Angeles GM Varuzhan Akobian. He is the highest-rated player in the western part of the U.S., and near the top ten in the country. “Var” was actually part of a big logjam at 6½ of 9, a score that rarely wins in the World Open. I am told it has happened, but not within my memory, which covers 30 of the 35 years it has been held. I asked Var how he felt about the supercomputers. He gave a sensible answer with which I agree, “You don’t race humans against cars, or horses, do you?” He did acknowledge that there is some chance of cheating because the programs are so strong, but dismisses a lot of the buzz as paranoia. Var is about to turn 24 and is studying intensively with another strong grandmaster. 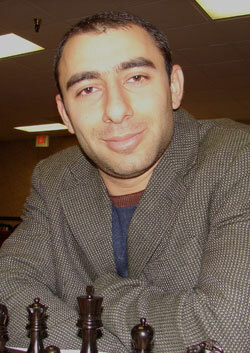 He sees his style as emerging and evolving at this time in his professional chess career. He has great ambition but feels he has time to meet his chess goals. I congratulated Var on his World Open victory and his great result in Cali (for a nice report on this event, please check out Chess Life Online and page 46 of this issue). He was self-confident but very gracious. I suspect that I will be talking to this fine young man quite soon after he has other triumphs. After this win, I became the new tournament leader and never relinquished my lead, remaining in at least a tie for first place for the duration of the event. Following my win at the World Open, I traveled to Cali, Colombia a few days later to play in the Continental Championship where I tied for first place with eight of 10 points. I was undefeated and qualified to participate in the 2007 World Cup in Russia in November. Thus far, we are following the game GM Levon Aronian-GM Boris Gelfand, Monaco, 2007. Here, GM Stripunsky spent nearly 40 minutes before discovering this novelty. Unfortunately, it does not offer Black very good chances after losing the g5 pawn. Other viable moves are 14. ... Rg6, 14. ... Ng4, 14. ... c5 with a highly complicated game. 15. Qxg5 Nd7 16. Bf4! Qxg5 17. Bxg5 Rh8 18. e5 Be7 19. f4 b4?! This move weakens the queenside pawn structure without allowing Black any counterplay. Better would have been: 19. … h4 20. Bf3 Rb8 21. Rad1; still, White has a nice advantage. I spent some time here considering a few interesting possibilities. With 20. Bxe7 Kxe7 21. Ne4 c5 22. Nd6 Bd5 23. Bxc4 Bxc4 24. Nxc4 cxd4 25. Rad1, White will win the pawn on d4 with no compensation for Black. The move 20. Ne4 also offers a sizeable advantage for White. 20. ... c5 21. Bxe7 Bxe4 22. Bxc5 Nxc5 23. dxc5 Rg8 24. Rf2 Rc8 25. a3 bxa3 26. Rxa3 Rxc5 27. Rc3 Bd5 28. Bxh5 and White has a static advantage because of the extra pawn. If 20. ... c5 21. Bxc4 cxd4 22. Bb5! Rg8 23. Rac1 Bxg5 24. fxg5, Black’s position simply collapses. This is a good move that capitalizes on the fact that the bishop on a6 is unprotected. It also increases pressure on c4. 21. ... Bb5 22. Bxc4 Bxa4?! I anticipated 22. ... Bxc4 23. bxc4 Nb6 24. Nb2 Rd8 25. Rad1. Black’s position is difficult as he is down a pawn and still has weaknesses, such as the pawns on c6 and h5. 31. ... h4 would have been more tenacious but Black’s position is still virtually hopeless. 32. Kf2 Nb6 33. Kf3 a5 34. Kg4 Kc6 35. Kxh4 Kd5 36. Bb3+ Kxe5 37. Kg4 Kd4 38. h4. This move fixes Black’s weak h5-pawn while protecting White’s pawn on g5 eradicating all doubt as to the hopelessness of Black’s position. This is a clever idea and Black’s last hope to create complications. If 38. ... Nb7 39. Kc4 Nxa5+ 40. Kxb4 Nc6+ 41. Kc5 Ne5 42. Bxa6. 39. axb3 Nxb3+ 40. Kc3! I want to control b3 and c4 with my king in order to reduce the squares available to the a5-knight. If 40. ... Nc5 41. Kb4 Kd6 42. h5 Ne4 43. g6 fxg6 44. hxg6 Nf6 45. Bxa6 and White is winning. The final touch, trapping the a5-knight. Black resigned in view of 41. ... Kd6 42. h5. The last round was a real disappointment. Only newly-crowned U.S. Champ Alex Shabalov fought hard, and he had to, to reach the 6½ score that nine players achieved. In 2004, Var won clearly by a half-point and got his picture on the November cover of Chess Life. He was the hero of the last Olympiad with his sensational last-round win, securing the U.S. team a medal. But this year he seemed to catch the malaise of the other GMs, who were overly cautious indeed. Even the usually combative Hikaru Nakamura made an uneventful 19-move draw with GM Victor Mikhalevski who is rated 30 USCF points lower. Var drew his last three games in a collective 37 moves! Perhaps it was the gloomy weather with a steady rain coming down on the last day. Perhaps it was over-calculation so as not to be left with less than $500 each as were those next 13 GMs who finished with either six or 5½ points. It seems that everybody but your writer plays the Sicilian these days. 30 or so years, so did I. I don’t miss it one iota! IM Tate has no shame—he goes right for the potential sac square, e6. Now we see the sting. Poor Black must move his monarch. How’s this for the unexpected! It’s an Exchange sac based on Black’s awkward king position. 22. Qb6 Rb4 23. Qxb4 Bh6 24. Bb5 Qd8 25. Rc6 Qd7 26. Rc4 Qd8, Black resigned. Tate always plays entertaining chess. I hope he will make grandmaster. There was an irony in the final standings. Alex Stripunsky, the intrepid stone-faced technician from New York, was second by one tiebreak point to Var. Why ironic? There were only two decisive games among the top nine dogs and both involved Stripunsky! The first was his victory over former U.S. Open Champion Evgeny Najer in round three, and the second, his loss to Var in round five. The World Open title hangs upon an “Armageddon” game. Black has five minutes and White seven, but if Black draws, he wins. Who gets what color? The high tiebreak gets his choice and, courtesy of his fifth-round defeat of Alex, Var took white and Alex got what was left, black. The table was set. What followed was a very exiting Tarrasch in which Var saddled Alex with an isolated weakie on e6 and relentlessly kept up the pressure. Bishops of opposite color did not save Black as Var invaded with his king and ultimately made a winning passer after the rooks departed the scene. This sharp encounter is not in the main database but it can be readily found in playing form on Chess Life Online, as can many other timely games from recent events. The crosstable reveals a lot of hope and a heap of disappointment. Young Eugene “The Pearl” Perelshteyn lost games to the musically-named Indian GM Sandipan Chanda (I love saying that name!) and had the tough, last-round loss to Shaba. Getting the GM title is just the beginning for this ambitious lad. Vadim Milov, the likable Swiss with the large ears, was undefeated and played five of the magic nine. All were draws, great for tiebreaks but not for money. Last years’ cover boy and U.S. Open champion Yury Shulman lost a fifth round game to fellow GM Darmen Sadvakasov and never quite recovered. Yury scored 5½ while his tormentor was shut completely out of the money with five! Young IMs like Justin Sarkar, Josh Friedel, Salvijus Bercys, John Bartholomew, Robert Hess and Bryan Smith, seeking GM norms and money, were shut out on each. The first five mentioned scored five while Bryan got an even score. Super GM Jaan Ehlvest left the building early after an eighth-round loss to Julio Becerra, one of the winners. On the “hope” side we have Tate, who won almost $1,100 for under 2500, and the truly remarkable performance of FM Teddy Coleman, who had an apparent IM norm with five points. Teddy lost his first game to IM Yury Lapshun and did not lose again until the last round when he faced GM Milos Pavlovic. In between he scored five out of seven with three draws and a win over GMs (he knocked veteran GM Lubomir Ftacnik out of the tournament in round six! ), a win and a draw against IMs, and a win over an FM. If Teddy had won his final round, he might have gotten a GM norm! Looking for fine performances, you just can’t miss WIM Batchimeg “call me Chimi” Tuvshintugs, formerly from Mongolia but now a fixture at the Mechanics Institute Chess Club in San Francisco. She drew with GM Melikset Khachiyan in round one and beat IMs in rounds eight and nine to make a sparkling five. No cash, but a great result in any case. There were only five winners in the Under 2400, and each had seven points. They each got $5,922 and change. The big difference with these players, who in prior years would have had to play in the Open, is that there were three of five decisive encounters in the last round. This provided some excitement which the Open simply did not have. There were a lot more spectators watching this section in the last round. You always hear about how some tournaments are really “fun” events while, at the World Open it’s all about the money. Well, I found that it’s not necessarily so. Oh sure, there are a lot of big eyes for five-figure prizes as there are in all “money” tournaments. But far more prevalent is a clear love for the game. “OK,” the guy says, stuffing his fold-up board in his chess bag, “I really had him! I made a cool sac and I was clearly winning, but I blundered. Damn, I played a nice game though. You want to see it?” If I have time I look. It’s hard to describe, but there is a light in the eyes of those who pursue this wonderful game and most of the time it goes beyond the money, beyond the struggle, beyond the ego, into a realm that even has religious overtones! That’s the message I get from a remarkable number of players at the World Open. It can be a GM or a 900-rated player that that feeling shines through. Shall we found the First Church of Caissa? We already have a lot of parishioners, and most of us more than tithe! Last year at the World Open the big story was the cheating scandals. Even the New York Times gave some coverage. This year, however, the directors came prepared. First, they had a radio signal detector. Second, there was a new rule. Anytime a player was scoring 80% or better, he could be forbidden to use earphones of any kind. Some players complained that opponents were using listening devices, but the directors had to explain that it was okay for them to listen to Guns and Roses if they didn’t have a good score! Most got it! This very practical “rule of 80%” will now be in effect at the four major CCA events—Chicago, World Open, Foxwoods, and Las Vegas. 1. d4 Nf6 2. c4 c5 3. d5 e6 4. Nc3 exd5 5. cxd5 d6 6. Nf3 g6 7. Bg5 Nxd5???? 8. Bxd8, Black resigned. This happened at a high board and it caught the attention of others in the vicinity playing for substantial prizes. There were complaints to the directors, but both players denied anything untoward. The kid told this to Steve somewhat reluctantly as he didn’t want to be a snitch. (This brings to mind Jay Leno’s favorite joke object: stupid criminals.) Steve then double forfeited them and wrote it on the wall chart. The loser, whom I will call player “B,” came into the TD room very indignant. He explained that he had touched the knight so he felt honor bound to move it. When asked why he touched the knight he had no answer. He then was told about the witness and immediately broke down in a fit of remorse and made a full confession. “I know it was wrong and I’m sorry. I will never do anything like that again!” He accepted his forfeit and was assessed no further penalties. Later the “winning” player came storming into the TD room full of indignation. When told of his fellow conspirator’s confession, all the air seemed to go out of him. “OK, we did it and I know it was wrong and I am sorry. Couldn’t we just play a real game now, maybe a fast game?” Some people just don’t get it. He was of course told in no uncertain terms that that train had left the station! The double forfeit stood but no further penalties were assessed. To tell you the truth, I don’t wish to seem draconian, but I would have tossed them completely out of the tournament and reported them to the Ethics Committee. I guess the “confessions” saved their butts, but both are on a CCA watch list. All told the CCA gave out about $280,000, by far the largest prize fund in the USA this year. The tournament was ably directed by the usual high-quality staff. Bill and Brenda Goichberg were on top of things at all times. I have already talked about Steve Immitt. Mike Atkins, Sophia Rohde, Bob Messenger, Jim Cope, and of course the great Walter Brown (no “e”!) did splendid work. Then there was Greg Vaserstein and Korey Kormick. I hope to see all my World Open friends in central Philly on Independence Day next year. I leave you with one last game, a nice win by the current U.S. Champion that shows how Alex is willing to take the necessary risks to do well in Swisses. The older 7. … e6 leads to almost unfathomable complications. Shabalov’s move does not contest the initiative, but sets the stage for a later fight. 8. Bf4 Bg7 9. Nc3 0-0 10. Qd2 e6 11. 0-0-0 exd5 12. cxd5 Re8 13. Re1 Na6 14. Nf3 Nb4 15. Bg5 f6 16. Bh4? White continues to call the tune after 16. exf6 Rxe1+ 17. Nxe1 Bxf6 18. Bxf6 Qxf6 19. a3 Na6 20. Be2. 16. ... Bf5 17. Bb5? 17. d6 is more circumspect. Exploiting the fact that the bishop's departure from the f1–a6 diagonal will allow ... Nd3+ and ... Nc4. A grudging retreat to f1 is now in order, though Black would win the d-pawn and assume the advantage. Strongest is 18. ... axb5! 19. f7+ Kxf7 20. Bxd8 Rexd8 when White’s king is caught in a crossfire of all Black’s pieces. Here comes the cavalry! Black has full compensation for the queen, though his own king position and White’s d-pawn are still cause for concern. 29. Nfe4 Re8 30. d6 Ndxb2+ 31. Kc2? Perhaps in time pressure, White cracks. After 31. Kc1 Nd3+ 32. Kd1 b5 Black is on top, but not yet winning. 31. ... Nxd6 32. Qxf5+, White resigned. In a tournament as cash rich as this, the winners of the class sections and their winnings (many quite a bit more than the top two sections!) demand a mention. First in under 2200 which had 170 names on the wall charts (in all of these, I will be giving the total with re-entries and house players included), still a tough section laced with ex-masters, North Carolina resident Chris Mabe took home 14,624 smackers with a clear first score of 8-1! The Under 2000 section, with a whopping 236, was led by Seven Toroussian with 8½, as close to perfect as you can get—he received the $14,624. Going down to Under 1800, we had another near-perfect 8½ for another $14,624. That performance was turned in by 1791-rated Steve Cramton from the great state of New Hampshire. Under 1600 saw yet another clear winner of $14,624; Nicholas Oblak, from the state of Vermont. With Steve and Nick, New England was awash with World Open money! That section had 157 names on the wallchart. Under 1400, with 142 players, had an anomaly. Although two players had 7½ to tie for first, Dru Knox from Virginia, got the $2,000 cap as he had been 20 points over his class in the last two years. This does not say Dru is a “bagger,” he just fit into that category of prize protection. Under 1400 took in a 300 point range under a new CCA format which has an Under 1100 section. In that Under 1100 section, Ian G. Morton from South Carolina was top dog by far. He picked clear first with eight points and won $5,118. The next person had only 6½, the largest margin of victory of any section! There were 52 in that section. Finally, the Under 800 and Unrated section, with low entry fees and trophies for prizes, drew 30 competitors. Kenneth A. Rivkin from New York and Robert Witkowski of Maryland, both unrated, each had 7½ and each got a trophy. Sevan, 20, of Glendale, California, followed up on his 6-0 score in the Under 1800 section of the National Open by going 8-0 here before yielding a last-round draw which won the Under 2000 section by a full point. That was worth $14,624, so he may be utilizing his business management major sooner than he had expected. Sevan’s family came to the U.S. from Armenia five years ago. He studies two or three days a week with GM Melik Khachiyan, and tries to put in at least three hours on his own every day. Looks like it paid off! A senior director from Memphis, 23-year-old Korey was working a CCA tournament for the third time. He was introduced to Bill Goichberg at a regional tournament, and Bill has since utilized his talents in Chicago and Valley Forge. Korey is currently working as a chess professional in the schools. This veteran floor director from Maryland is always good for a few anecdotes. When a four-year-old was unable to find his board and wasn’t sure he could recognize his opponent, Jim took him to the bottom boards in the section, and the right spot was quickly found. On another occasion, Jim mediated a communication problem between a New Yorker and a foreign player, deducing that the latter urgently needed to use the restroom! This amiable 31-year-old from Tennessee earned $449 with 6½ points in the Under 1400. He works at Vanderbilt University as a financial analyst. Jonathan’s vacation with wife Kerin and one-year-old Noah just happened to coincide with the World Open! History buffs, they took in the sites of Philadelphia and Valley Forge. He plans to do more of those diaper changes out of gratitude for Karen’s indulgence of his chess playing at Valley Forge. An athlete in his youth, Jonathan took up chess when someone brought a set to a class at Hollis High. He eventually was instrumental in forming a school team. Jonathan loves chess, but “It’s usually on the backburner to my family and job.” He admires former world champ Boris Spassky—and notes that Boris didn’t allow his children to play chess. Since Noah already likes to hold a pawn (“It’s the only piece that will fit in his mouth.”), Jonathan may not follow that precedent. It was a pleasure talking to these folks from the San Francisco Bay Area. The father, Vladimir, a mathematician who works as an investment professional, was born in Kiev and came to the U.S. in 1979. Lena, a piano teacher who grew up in Baku, immigrated in 1981. Eleven-year-old Daniel, rated 2142 but playing “up” in the Under 2400 section for the experience, stands only 4’9” (was it my imagination, or did this tournament have more players under five feet than I’ve ever seen at a non-scholastic?). He finished with a fine 6 points out of 9, earning $327 (he did get two forfeit wins, a 214 million to one shot according to Vladimir). He joins 16-year-old Alan at school this fall, and they’ll finally have a team. Alan, rated 1943, took a five-year break from chess; his return was inspired by all the trophies Daniel won. Alan also enjoys piano (having performed in concerts) and soccer. His coach is the popular FM Michael Aigner. But with six hours of homework everyday, he has little time for study. Writing is something he particularly enjoys. Daniel is the chess workhorse of the family, putting in six hours a day studying during summer and two or three during school. He studies online with GM Greg Kaidanov. Daniel emphasizes the importance of analyzing his tournament games within one day, the first time without computer assistance. He’s been the top under age 11 player in the U.S., and has represented us in youth tournaments in Ecuador, France, and Georgia, finishing between third and fifth each time.